A Correct Map of Jamaica. 1757. Maker: Georg Ehret. The pass which admits a communication between Spanish Town and this vale ought not here to be unmentioned. After traveling about three miles from the town on a pretty level road, we come to a sugar plantation formerly called by the Spaniards Los Angelos, and now The Angels. Just beyond this begins the entrance of the pass. From hence to the opening into Sixteen-mile-walk, for the space of four miles and a half, is a continuation of precipice on both sides, divided only by the river, except a small elbow at the end of four miles, where a few acres of level ground at the foot of these ridges has admitted of a little sugar-work. 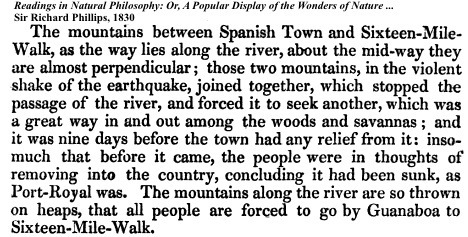 The road cut into the side of the mountain falls by an easy descent to the bridge, and crossing the river is conducted along the remainder of the way not many feet above the surface of the water: it is therefore subject to be broken away in many places by the violence of floods; but this inconvenience is submitted to from the impracticability there appeared of carrying it higher through such immense masses of rock as form impediments the whole way. 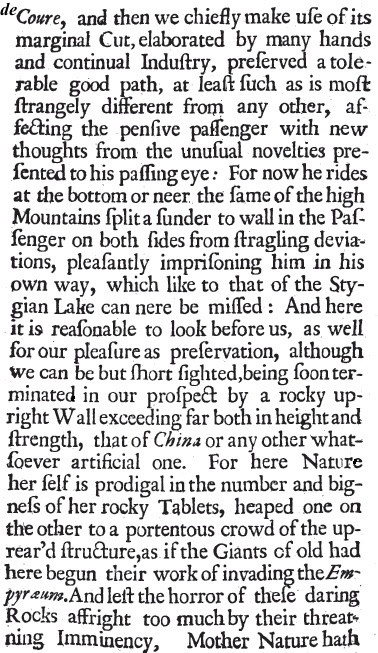 For a considerable length, the road is walled up; and, as it is so liable to damage, not only from inundations of the river, but the falling of large trees, rocks, and earth, from the impending crags and precipices under which it runs, the expence of repairing it is very great, and requires a standing body of workmen, who are employed the whole year to keep it in order. The height of the mountains on each side overshadowing it morning and afternoon, the passage is extremely cool and agreeable; every turn of the road presenting the eye with new appearances of the river, the rocks, and woods; whilst the water, sometimes roaring and foaming in its current, where it is confined to a narrow and rugged channel; at other times gliding smoothly and silently along, delights the traveler with an alternate variety. At the end of four miles, the mountain called Gibraltar opens to view avast solid wall of rock of prodigious height, whose surface, apparently perpendicular, is nevertheless cloathed with trees and shrubs from the base to the summit; the tops of one row terminating where the roots of the next row begin, so as almost to seem growing one upon the other. After heavy rains a cataract spouts from the pinnacle of this stupendous mass, rendering it still more awful and romantic. The defile continues not far beyond this majestic object, though not widening till we enter at once the extensive and beautiful vale of Sixteen-mile- walk. 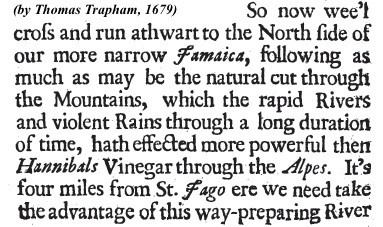 This comment from Thomas Trapham, M.D., in 1679, is the earliest description of the route through the hills to 'sixteen-mile-walk' that I have found so far. 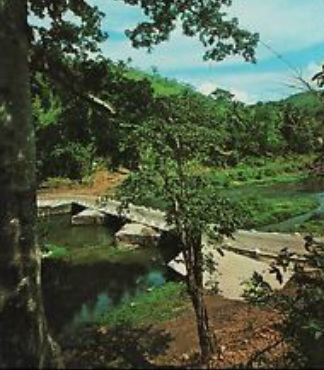 note: The phrase 'River de Coure' fazed me: I'm not sure I have the correct explanation - the Rio Cobre is the 'Copper River' either because it tasted of copper, or was the colour of copper when in flood. 'Coure' as far as I can discover is 'copper' in Catalan, so that would give 'River of Copper' - but why Catalan, I have found no explanation. Can someone help out on this? 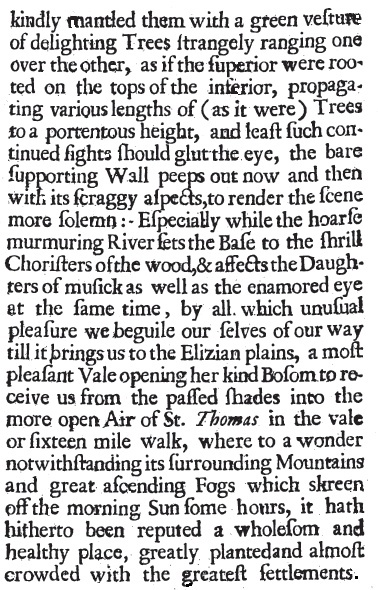 Hakewill and the Ehret map have 'Six-Mile-Walk', but this account, along with a number of other sources, including Hans Sloane, writes of 'Seven-Mile-Walk' - which was perhaps much the same place! 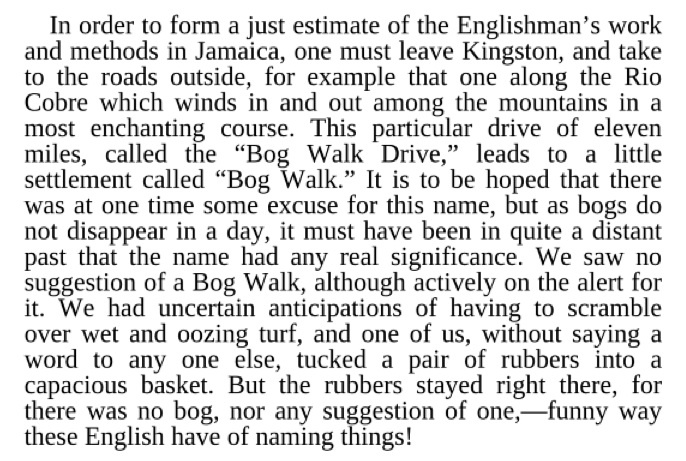 The descent from St. Catherine's Parish, to which Spanish Town belongs, into the Parish of St. Thomas-in-the-Vale — through the "Bog Walk" so called, — is picturesque and grand. 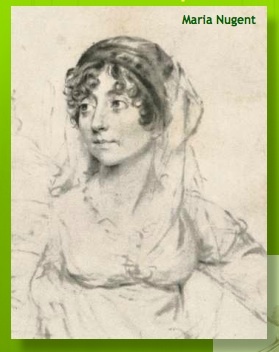 The road winds along a stream, from whose banks the hills rise precipitously and form a narrow gorge. Every furlong furnishes some new variety to the scenery. 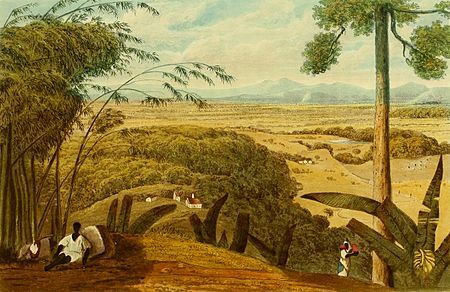 You look back and trace a silvery thread of water through the graceful plumage of a bamboo cluster - now it is a grove of plantains, or some huge gaunt cotton tree, rising above its compeers, and stretching its arms from hill to hill, that forms the foreground of the picture. Mountains on every side; and the passages among them are at times so narrow and the precipices so steep, that the traveler involuntarily hurries on, fearful least some sudden catastrophe in this land of untoward convulsions should bring the hills together and fill up the chasm forever. EMANCIPATlON IN JAMAICA. II. 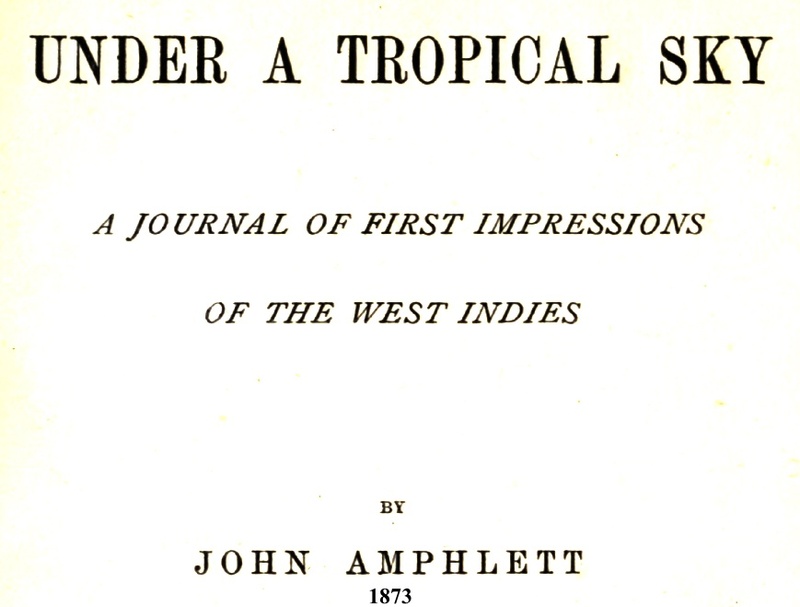 A Tour of Observation—Spanish Town—St. Thomas-in-the-Vale—Mount Diabolo—The Moneague. From Our Own Correspondent. KINGSTON, Jamaica, January, 1860. Then we turned suddenly away from the river, and passing between some high banks covered with verdure, we came out again near the river and about the same distance above it ; and now the real beauties of the drive began. Down below on our right rushed the river, fringed with towering bamboos, waving gracefully in the gentle breeze, while the opposite bank rose steeply, covered with all the variety and luxuriance of tropical vegetation. On our left, too, rose a steep bank, into which the road was cut, and in whose interstices and crannies abounded the most lovely and graceful ferns, while languid Heliconias and other insects fluttered lazily in the shade. The branches of the trees above overspread the road, and a light breeze which blew down the valley took away the heat of the noonday sun. The road sloped gradually down to the water's edge, and close to the massive remains of an old Spanish fortress, now shrouded with verdure, crossed the river on a rough wooden bridge on brick piers, destitute of any parapet. We now continued up the gorge, with the river on our left some forty or fifty yards wide. The Bogwalk river, though so calm and peaceful when I saw it, is liable to sudden fits of anger, and rising some twenty feet above the road, sweeps away everything in its wrath. 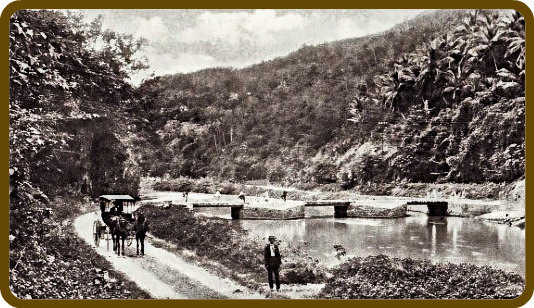 Passengers along the road have to use the utmost speed of horse or foot to escape the sudden rush of the torrent. 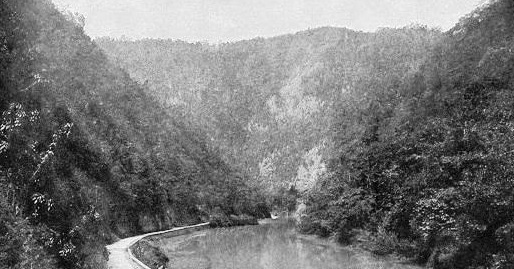 The hills rose up nearly perpendicular on each side some four hundred feet, sloping only sufficiently to afford a foothold for the trees, and in some places absolutely precipitous. The river wound in and out amongst the hills, affording fresh peeps of beauty at every turn. Let me try to describe a reach of the river. rugged rocks, covered with creepers and mossed over with lycopodiums, while by the river edge wave giant tufts of bamboo and quivering patches of wild cane and tall reed-like grass, the river all the while foaming and murmuring over its rocky course. Just across the river, a hundred yards ahead, the opposite bank of the river ends in an overhanging precipice, a hundred feet high, from the summit of which long lithe creepers drop down and bathe their leaves in the water, under whose shade flourish lovely green tufts of ferns and moss. And over all the summer sun shines down, powerless, however, to destroy the refreshing stillness of the gorge. Yet, with all this beauty, the wandering breeze kept now and again waving down to their destination in the running stream yellow faded leaves. Bright-hued butterflies glanced here and there, and a rustle among the verdure told of the startled lizard, seeking security amongst the crannies of the rocks from the intruder presumptuous enough to disturb it in its lovely home. But there was a great lack of birds ; perhaps 'a lazy carrion crow would float down the gorge, with its ashen grey wings extended, the feathers at the end of them so wide apart that they seemed to form a spectral hand, and perhaps a humming bird would dart by so quickly that it was gone almost before it was seen but other birds there were none. Everywhere in the sunshine Thunbergia alata covered the bushes by the roadside with its buff flowers, and in the shady places orchids flourished, sometimes forming immense tufts of harts-tongue-like foliage. 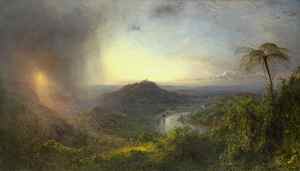 I had dawdled along the way so much catching butterflies and picking ferns, that my watch warned me that it was time to return, and I was obliged to do so, though I had not reached the end of the gorge ; but I was in a perfect shiver of delight at the beauty of what I had seen. 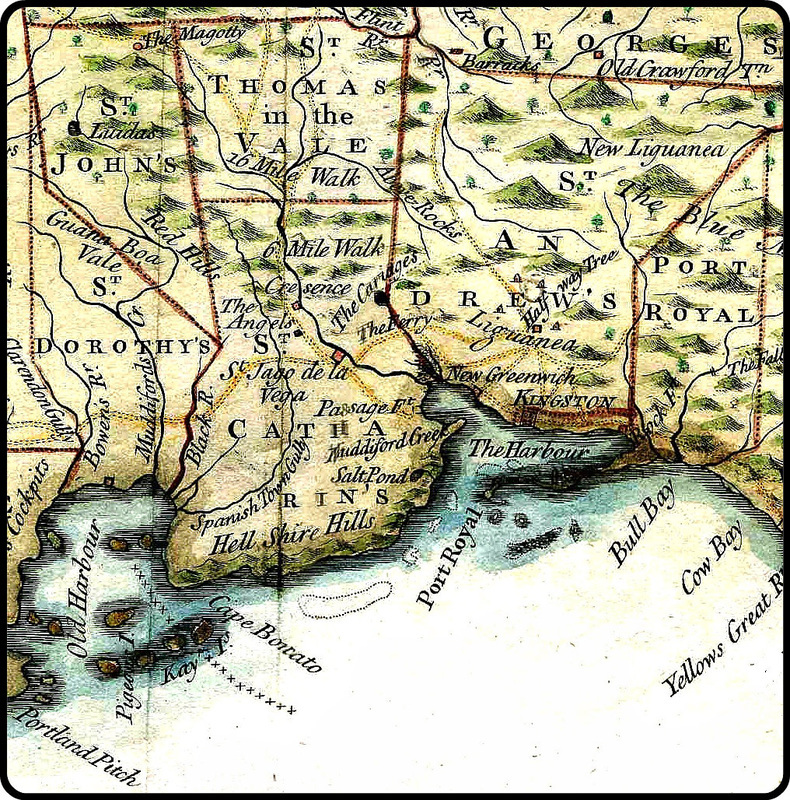 My wretched horse and rickety carriage brought me back to the railway station at Spanish Town, and I returned to Kingston well pleased with my excursion. Deep in the very heart of this island rock of ours lies a secluded valley hemmed in on every side by towering hills. Favoured by copious showers from the clouds that drift continuously from the east and watered by many streams that rise amongst the untrodden heights around it is little wonder that St. Thomas ye Vale should be the delectable valley it is. 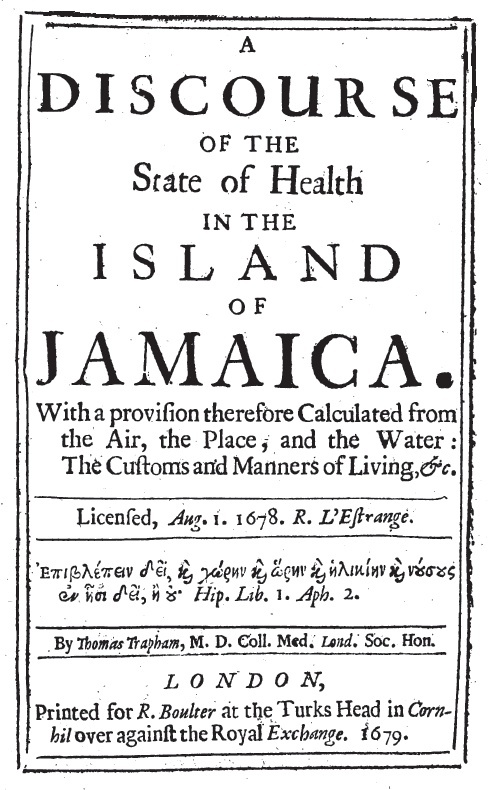 The very names of the products cultivated within its borders and brought in to the stations for the metropolitan market suggest the rich and fertile nature of the soil—coffee, pimento, ginger, cocoa, bananas, oranges, corn, sugar-cane, tobacco, logwood, fustic, annatto—surely a goodly land! St. Thomas in the Vale lies in the upper part of St. Catherine and is reached from the south through a great natural ravine in the amphitheatre of hills. The streams in the valley unite at the entrance to this gorge and flow through as the Rio Cobre River which traverses the plain of St Catherine and ultimately finds its way into the harbour. Up this ravine also runs the railroad from Spanish Town, while the main road from the same town winds along in the deep shade at the bottom. The surrounding hills are composed of white limestone, extremely indurated, which resists the "weathering" of the atmosphere and the action of running water to a much greater degree than any of the other secondary rocks. Granting then an initial cleft in the hills the channel which the Rio Cobre has carved out for itself at Bog Walk is plain evidence of the countless generations during which the dominant features of the landscape must have been the same as they are at present. A consideration of the physical structure of this district opens up many interesting geological questions which it would be both pleasant and profitable to stay and discuss, but our object is a different one to-day. 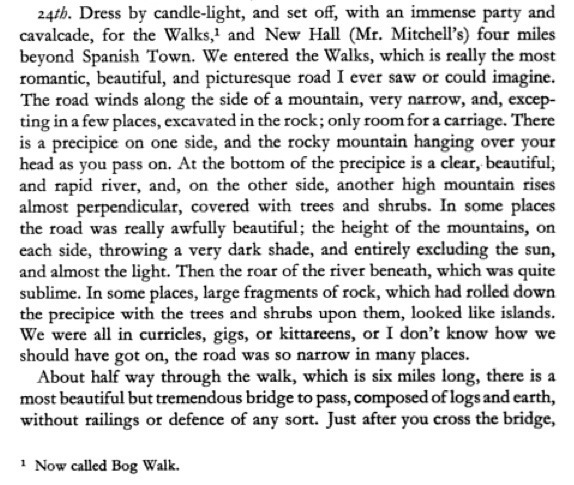 Much has been written from time to time about the Bog Walk, the great natural entrance to St. Thomas in the Vale from the south. The valley itself is a picturesque scene from Mount Diabolo which turns up on the northern boundary and it was here that Anthony Trollope remarked upon the selfishness of the devil in appropriating to himself some of the loveliest points of the scenery in the world. But it is upon the Bog Walk that admiration and fine writing has most been lavished. True, some travellers have likened it simply to a Derbyshire or Welsh River "with tropical vegetation, overhanging cliffs and a capital road." But in general the most unstinted praise has been written about this spot. Like others who have read most of the two enthusiastic descriptions I long wished to explore the beauties of the walk for myself and now, having seen it in early morning, at high noon, and in the moonlight, what are my impressions—which, I take it, are the impressions of an ordinary average traveller? Let the sequel tell. Melt into morn, and light awakens the world,"
As the sun appears above the hills a thousand lights begin to play on the rippling water, making the scene still more pretty. This spot may be said to mark the entrance to the defile. A little further on and the rocks on either side begin to close in, the sunshine is lost, shadows lie across the path, and the air is cool, and damp The river flows placidly on the right, and is hidden by bamboos, creepers and luxuriant undergrowth. From these and from the rocks above come twittering of birds and the hum of insect life, with the low accompaniment of the wind among the foliage. A humming-bird flashes near, hovers beneath a flower for a second, the quiet vibration sounding pleasantly in the ears, and then is gone. A boy with books under his arm goes fast, his whole face a stare, his feet and legs innocent of covering, he wonders probably what the ferns and plants are being so carefully collected for; perhaps he believes we are "white obeah". The little caves in the side of the road are the homes of the fern. Delicate maiden-hairs grow out of the soil there that would make an English collector's heart glad if he saw them. With such surroundings the road continues for about a mile, the river being on the right. Then one crosses to the other bank by a low flat bridge, and the rocks continue to tower up higher on both sides. The river now lies plain to your sight: it is broad, and deep and muddy from the rains, and it flows along silently in the deep shades. From its very edge rises the cliffs which shoot almost straight up to a great height, and yet are covered with a rich growth of tropical trees to the summit. Imposing as this part of the ravine is, it is surpassed in grandure by what follows. The cliffs ever heighten as we advance, and begin to hang over in ponderous masses of bare rocks mingled with vegetation of pure rich green. The river comes tumbling down a rocky channel, its course being impeded by huge boulders round which the waters rush and eddy and lash themselves into foam. About the rocks on the banks grow innumerable bamboos, wild canes, creepers and other tropical vegetation in the rankest luxuriance, while above, to the very summits that seem to touch the blue sky, the precipices are clothed with hardy trees which grow out of the interstices of the solid rock. Along the side of the road are caverns, cool and damp with walls delicately veiled in green, and here and there a bright wild violet as points of relief. There are the songs of the birds from above, but the principal voice in the gorge is the voice of the waters as they rush over their rocky bed. For ever winding and echoing in this long ravine it seems to one who stops and listens that there are spirits in the water crying to each other. One can understand how the Greeks long ago came to give each stream its god. Farther on there is less complexity of environment but perhaps the greatest surprise of all to the visitor is towards the termination of the glen where a magnificent precipice on the left rises to a dizzy height, sheer from the water of the river. From base to summit the rock is mantled by a covering of dwarf palm trees and scrub, these growing out of the very rock, and rising almost at the same angle. Through the heart of this rock the railway train thunders day after day, and as it emerges from the tunnel among the rocky hillocks farther down in the gorge it awakens the sleeping echoes by its prolonged whistle of warning. At the foot of the cliff on the road side is a dismantled workshop of some kind, a melancholy object, with machinery lying embedded in the earth and rusting at the sweet will of the elements. A few steps from this and the cliffs recede to right and left, the view opens, and we have finished our progress through this long pass, this wild entrance to a fair and fertile valley. The chief features in the Bog Walk which strike a stranger are the height of the cliffs and the luxuriance and persistence of the vegetation. These combined make a remarkable scene, but not one which cannot be equalled elsewhere. Many of the Highland glens of Scotland are as wild, and romantic, and possess as lofty cliffs, but they want the rich clothing of foliage which lends so much beauty to the Bog Walk. Many a Welsh river is a Bog Walk in everything but name. Still, the tropical scene must always carry off the palm, if not for one feature then for another. The spots I have mentioned are beautiful in the light of the morn, but he would be bold who would say that they excel the Bog Walk under the same circumstances. 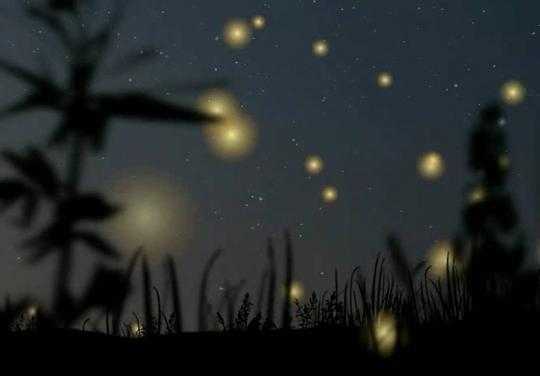 For to the natural features, already beautiful, you must add the strange soft glamour of the tropical moonlight, and the pulsations of myriads of fireflies which from crown to foot illumine the precipices like wandering stars.